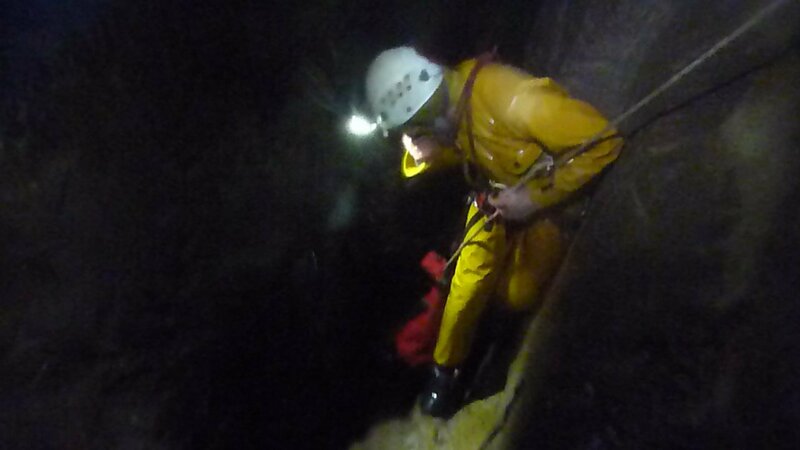 With the visit of a French member of TNC with very specific caving requirements the planned trip this week was a round trip down Lancaster Hole taking in Montague's West, Wilf Taylor's Passage the main drain and Fall Pot. 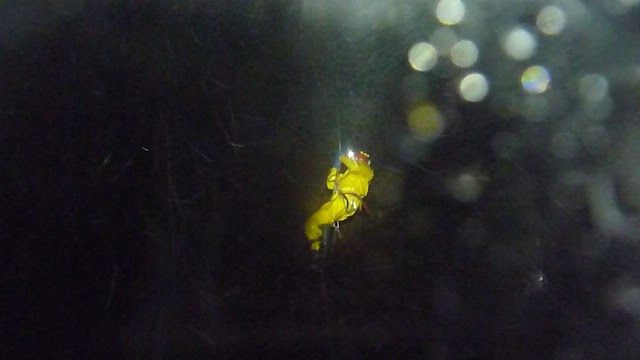 Another frosty night saw us walking across the moor to the entrance with an unusually large team. Phil, Sharon and David were along as well as the usual suspects, but Ali was off in Scotland celebrating Lee's birthday. The entrance pitch already had a rope down it so once our rope was rigged we made double quick time entering the cave. The water level was low due to the freezing temperatures outside and the fact that it hasn't really rained for two weeks. Kath's way was quickly dispatched followed by Bill Taylor's passage where the shower bath was absent due to low water levels. At Fall Pot the mud slope was ascended to the start of Montague's West passage. A leisurely traverse of this passage took place with frequent stops for photographs. When the T junction where the water from Bull Pot of the Witches was met the silence was deafening as there was no water at all flowing out from the upstream sump. Evidence was everywhere in the roof and walls of the huge volume of flood water that had flowed through the passage two weeks earlier but today the flow had ceased and silence rained. Following the stream bed downstream led us into the superb water washed tube of Wilf Taylor's passage. Some photos later we moved on and soon arrived at the roped downclimb of double decker pot, which has been re-equipped with nice new ropes to aid the climb down. Once at the bottom of this the passage soon arrives at the master cave of Easegill Caverns and the downstream sump, which was quiet but the froth of recent floods was high on the walls. A stroll up the streamway past Fall Pot led to the beautiful cascades where more photos were taken and then the climb out began. Back at the entrance to Lancaster Hole the two ropes were still in place so we were double quick exiting the cave and Sharon was relieved that there was no water falling down the pitch as the last time she had climbed the pitch there had been a lot of water falling down it and she thought she was drowning! The surface temperature was once again well below freezing so the first people out returned to the cars while the last ones out de-rigged the pitch. A swift drive down off the fell saw us all in the Snooty Fox where John joined us. We haven't seen him since before Christmas as he has been in South America so we were entertained to his stories of summer and sunshine. The post script of this trip was, however, an awful dawning awareness that one of our members might be changing his club allegiance. Where as once it was 'all for one and one for all' no secrets and share everything, it transpired that this one longstanding and at one time trustworthy member of the TNC yearns to enter another clubs competitions and shares a secret with them that he refuses to divulge to those that he once called 'friends'. This is not Ali who the TNC may yet sell (for a transfer fee yet to be negotiated) to another club who wish to have him for his youthful enthusiasm for all things dark, technical, tight and wet, but an original member. This may be the start of the end for TNC as internal politics rip us apart. Keep watching this space. Years ago when we were but mere youths we used to go caving on a Saturday such was our keenness to explore the underground excitement of Yorkshire's great and famous potholes and caves. Here we were once again going caving not on a Thursday night but a Saturday night. That was good, club honour saved again. The venue a trip down Juniper Gulf (probably last descended by myself in those youthful Saturdays) is described by John Gardner as a cave that typifies the best of Yorkshire potholes: wet, deep, vertical, and culminating in one of the finest shafts in the country. The walk across the Allotment with three tackle bags, one containing an 80m 11mm rope was completed in the daylight, which made finding the entrance a lot easier. Once there, however, finding the P hangers for the entrance pitch was made harder due to the covering of snow that lay over everything. Once found and rigged pitch one the daylight shaft was descended and suddenly we were in the warmer environment of the underground. Pitches 1 and 2 went smoothly apart from the rope not being long enough for the traverse and drop (having rigged the bad step, which was deluged with icy water) but we sorted that with some lateral thinking and knot tying. At the bottom Tom headed off with the tackle bag for the third pitch leaving me to lug the 80m rope through the 'traverse'. Gardner describes this as, 'rather unfairly described as "nasty" in the old guide book. 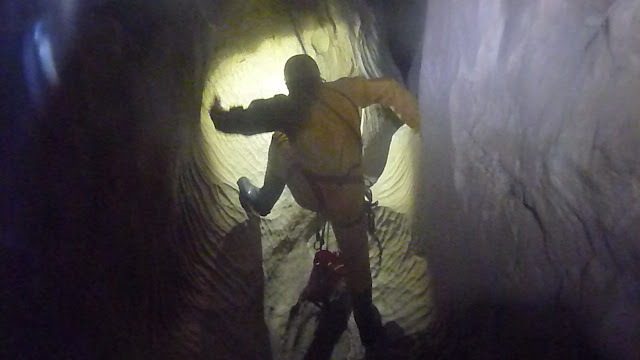 With heavy-weight equipment, there is no doubt that it would be arduous and awkward, but progressing along it with a rope bag does not present problems for the modern caver'. How wrong he was! Twenty feet from the bottom of pitch 3 Tom realised that the rope was yet again too short for the pitch! The 80m beast came into its own and a quick fig of 8 knot later joining the ropes together we were down, rigging the traverse to the head of the final shaft. A crawl through another icy deluge led to the sloping ledge at the top of the 45m free hanging pitch. Tom rigged this and a fantastic descent, clear of the waterfall that entered from the left and half way down another that entered from behind a wall of rock to the right. At the bottom the rope had 2m to spare but the volume of icy water that poured and thundered down the final little drop meant that we didn't descend this to wander down to the sump pool. Instead we set off back up the pitch, Tom's Scurrion light illuminating the flutings and smooth walls of the huge shaft to great effect. The exit from the cave was smooth but somehow I managed to end up carrying the tackle bag back through the traverse! Once below the entrance pitch we saw snow falling down from the surface. Climbing out onto the moor we met temperatures well below freezing and the gear iced up immediately. The walk back should have been straightforward with Tom having his GPS with the route on it. A lapse in concentration, however, had us walking for a while 180 degrees in the wrong direction when we hit a track that we should have crossed adding some distance to the return journey. Back at the car a bitterly cold change and we were heading to a warm welcome and great pint at the Gamecock Inn.